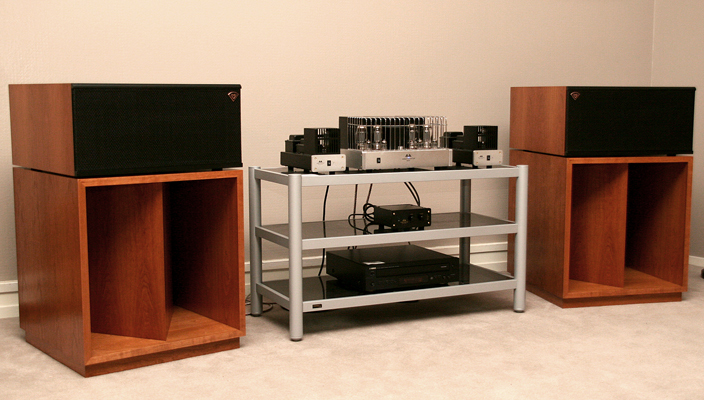 The La Scala II loudspeaker is built to rigid Klipsch standards — the toughest in the industry! Remember great sound? We do, too. The Klipsch La Scala II enclosure is still made in the USA, by proud craftsmen in Hope, Arkansas. Just like Paul W. Klipsch (PWK) intended. When the La Scala first launched in 1963, audio pioneer Paul W. Klipsch made it for Arkansas gubernatorial candidate Winthrop Rockefeller to use as a public address speaker. Because some considered it a “portable” and more affordable version of the revolutionary Klipschorn®, the La Scala found success beyond the campaign. Despite its raw, unfinished appearance, the fully horn-loaded, three-way La Scala sounded so good that people still wanted to put it in their living rooms. Remaining virtually unchanged since those early campaign days, Klipsch decided to cosmetically improve the raw-looking La Scala by totally redesigning the way the cabinet was constructed. The goal was to achieve a more finished appearance and improve cabinet rigidity. It is now available in a variety of high-quality wood veneer finishes. The La Scala II also includes a grille to cover the mid- and high frequency horns. The bass horn cabinet walls are now constructed of 1-inch thick MDF rather than 3 /4 inch plywood to offer more support, decrease resonance, and deliver cleaner bass response. Klipsch only uses book-matched wood veneers for the Heritage series. The veneer leaves are kept in order as they are delicately sliced from the timber and precisely arranged to provide a mirror image at the splice joint — like turning the pages of a book. This gives each speaker an aesthetically appealing and consistent appearance that is treasured more than any other cut of wood veneer. Each pair of Heritage series loudspeakers is grain-matched, using wood veneer panels that come from the same timber. Each cabinet is carefully matched so that each speaker in the pair is practically indistinguishable from the other. The speakers move seamlessly together through the factory, and each finished product is inspected and labeled with sequential serial numbers, ensuring that your Heritage series speaker leaves the factory as a meticulously crafted set. 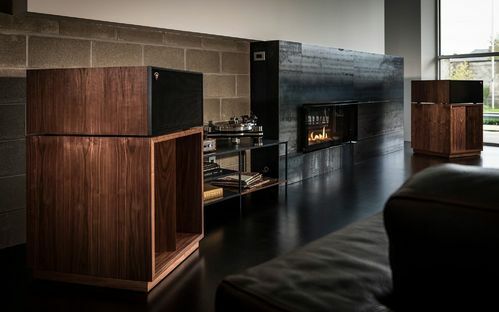 While each and every component of the La Scala is built to last, Klipsch has always recognized the unique and critical role of a loudspeaker’s cabinet in the sound reproduction process. From the craftsmen in Hope, AR to the engineers in Indianapolis, Klipsch has always put an extraordinary emphasis on cabinet design. The La Scala II enclosure is assembled using only the highest-grade adhesives and fasteners. This is a speaker you will hand down from generation to generation.